I'm using a Gateway Desktop with 8GB of RAM and an Intel® Core i7 CPU 860 @ 2.80GHz processor. The O/S is Windows 10 Pro. I'm using Roxio VideoWave from the Roxio Creator 2012 Pro suite. I'm using the menu Output / Export As... from the pull down menu's. On the pop-up screen I've chosen All/NTSC, AVC better quality and have put in the proper file name. When I press the Create Video File button I get another pop-up with the ATI Stream Technology in the background and then a message: "Roxio Videowave / Error / An error occured during rendering". There is just an OK button to accept. The word "occurred" is misspelled in the error message. This isn't a lot to go on. I have no idea what the problem is. Have you seen this type of thing before? Are there logs anywhere? Thanks for looking at this. I appreciate the help. The O/S is Windows 10 Pro. 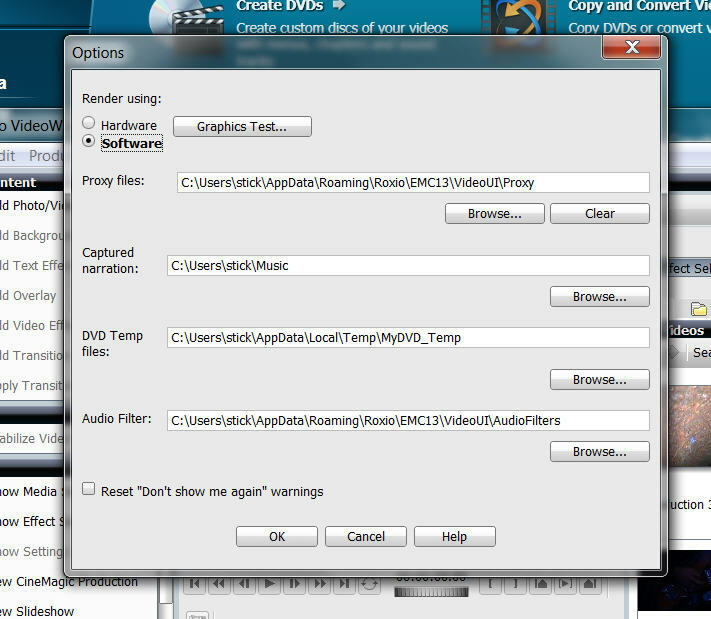 Creator 2012 isn't on Roxio's W-10 compatible list. It is five year old software, XP. Vista, and W-7 compatible. Check tools, options and see if you rendering in hardware or software? Is the video card driver updated? Thanks for the quick reply. I changed the Render Using option from Hardware to Software and left the "Enable Intel® Enhanced for Core/NVIDIA CUDA®/ATI Stream® technology to speed up video render" checkbox alone. It exported an MP4 just fine. By the way, I understand what you mean about the old version. I'm in a time crunch right now, but can upgrade later. I assume the latest version is: Roxio Creator NXT 4. Is the User Interface much different? I assume that the project files (dmsm) import into the new version fine. Again, thanks for all of your help. I really appreciate it. You have one of the best last version 'Roxio Creator 2012 Pro suite' if it works keep using it. After 2012 application modules were taken out or dumbed down, Nxt4 I wouldn't recommend. Don't assume that C2012 project files will work in NXT 4 - in almost all version projects from older version do not work in the newer version. It is recommended to always finish a project in the version your started with. Forget about NXT 4 if you want to create any DVDs or BlueRays. NXT 4 has dropped the myDVD of previous versions with a completely new myDVD which is really dumbed down and useless.